Grand Illusions Vinyl WoodBond Walnut (W103) is the focus of the July 2013 World Fence News cover article. Why it’s Grand Illusions Vinyl WoodBond of course!!! July 2013 was a big month for Grand Illusions Vinyl WoodBond woodgrain vinyl fence products. 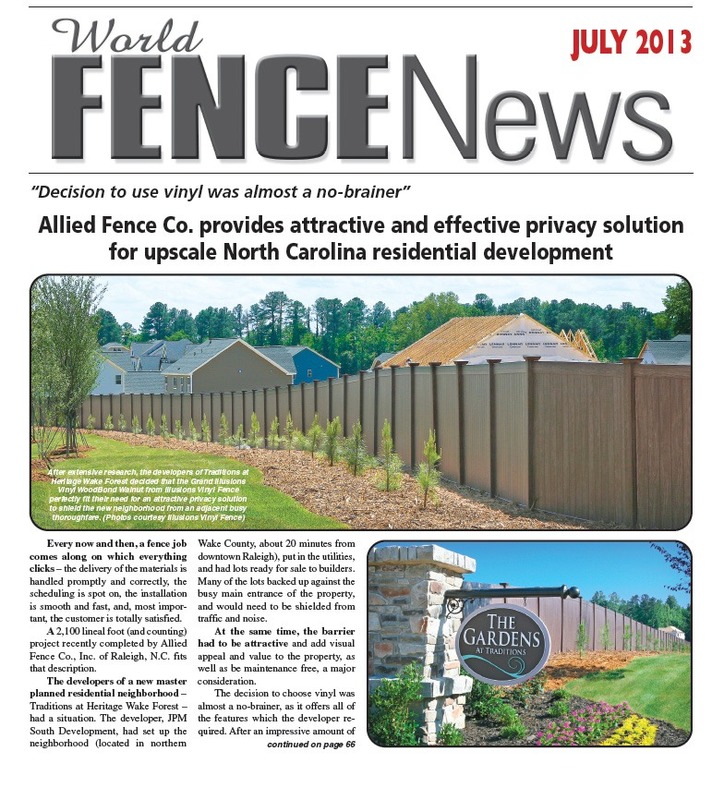 A huge cover article was dedicated to a great install at a new community being built in Wake Forest, Carolina. 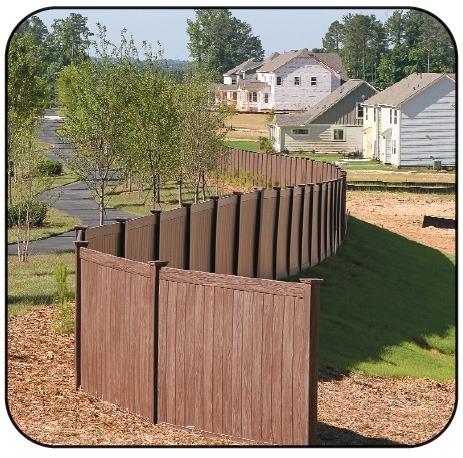 After extensive research, the developers of Traditions at Heritage Wake Forest decided that the Grand Illusions Vinyl WoodBond Walnut from Illusions Vinyl Fence perfectly fit their need for an attractive privacy solution to shield the new neighborhood from an adjacent busy thoroughfare. Every now and then, a fence job comes along on which everything clicks – the delivery of the materials is handled promptly and correctly, the scheduling is spot on, the installation is smooth and fast, and, most important, the customer is totally satisfied. A 2,100 lineal foot (and counting) project recently completed by Allied Fence Co., Inc. of Raleigh, N.C. fits that description. 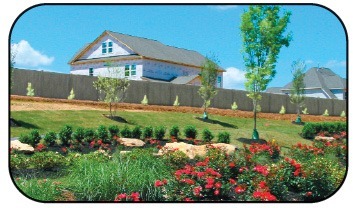 The developers of a new master planned residential neighborhood – Traditions at Heritage Wake Forest – had a situation. The developer, JPM South Development, had set up the neighborhood (located in northern Wake County, about 20 minutes from downtown Raleigh), put in the utilities, and had lots ready for sale to builders. Many of the lots backed up against the busy main entrance of the property, and would need to be shielded from traffic and noise. At the same time, the barrier had to be attractive and add visual appeal and value to the property, as well as be maintenance free, a major consideration. The decision to choose vinyl was almost a no-brainer, as it offers all of the features which the developer required. 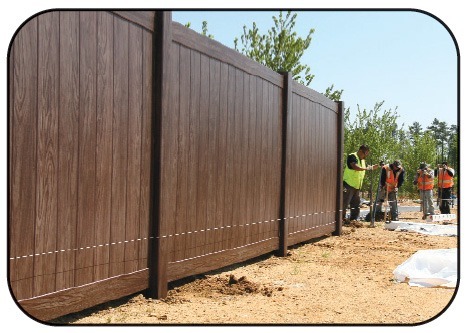 After an impressive amount of due diligence and research, JPM South went with one of the options offered by Allied Fence – the Grand Illusions Series Vinyl WoodBond Walnut privacy fence from Illusions Vinyl Fence. Illusions is a division of Eastern Wholesale Fence Co., Inc., headquartered in New York, which has been manufacturing and distributing fence products to the trade for over four decades. Q: You guys just completed a huge install in North Carolina, right? A: Yup, it’s about 2,100 lineal feet of 6’ vinyl fence for a new neighborhood near Raleigh that could eventually total 500 to 600 homes. A developer came in and set up the neighborhood with the utilities and all, and then laid out the lots. These lots lined up against the main entrance to the neighborhood. The houses that would be built needed a barrier between the back of the lots and the main entry of the road, because it’s busy. We’ve done a bit of work with JPM South, and they said they wanted a privacy product that would allow the builders to barricade their lots against the road. They wanted color, as well as low maintenance. They didn’t like the plain shiny white PVC, but they did see the Illusions product and the Grand Illusions Vinyl WoodBond Walnut appealed to them. JPM actually went onto the Grand Illusions web site on our advice and picked the Walnut from the variety of colors. So we took them a sample of Grand Illusions Vinyl WoodBond, Eastern White Cedar, and a Grand Illusions Vinyl WoodBond Walnut sample and let them decide. I really like the Eastern White Cedar, I think that looks great. But I didn’t want to sway them either way. They wanted the darker color. They felt it had a classy look. It blends in and looks great all year round. So we went in and installed pretty much two straight lines parallel to the back of these lots, which took care of the entrance to the left and to the right. There was a small berm there, but when you stood on the lots themselves and looked out, you could see the tops of the cars and hear a little noise. They started to plant some bushes and that type thing, but that wasn’t going to be adequate. So this 6’ high solid PVC Walnut barrier gave them a wood look with the maintenance free feature of PVC. It gave them the privacy that they needed and knocked down the noise. Q: How did they come to choose the Grand Illusions product? A: We have used the Grand Illusions before, working through Master Halco, a good company. They gave us a sample. Another company gave us a sample as well, but JPM liked the woodgrain look without the texture. You can feel the texture in the molded PVC, whereas the Grand Illusions has a smooth surface, but still has the textured look of Walnut. They like the smooth surface that wouldn’t gather mold or mildew or have any effects of discoloration. And they liked the woodgrain because that was what they were after originally – basically a wood barrier. But as a developer, they wanted to sell it and leave, and not be bothered with any maintenance. Of course we went through the whole Grand Illusions gambit as far as the A-Z of the Illusions Fence Design Center, and they stuck with the Walnut. They felt it gave them a classy dark look. With the landscaping they have in front, I think it looks swell. We just finished up the grand opening, and I talked to the developer, Doug Radford, and he said everything went well. There are four builders now. All of these first phase installs back up to the main entry. It goes into a big roundabout and there’s going to be Phase 2 and Phase 3. This is just the first phase. So we have the opportunity to do Phase 2 and Phase 3. The developer and builders are both happy with the product. The developers actually preferred a wood barrier strictly for the appearance, but did not want a product that required any maintenance. the solution was the Grand Illusions Series Vinyl WoodBond, which provides a wood grain appearance, but is non-textured. 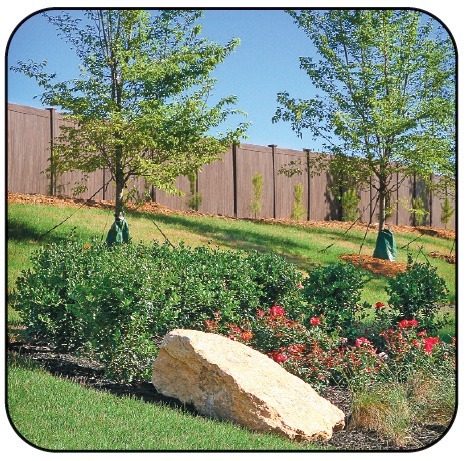 The Walnut color chosen subtlety blends with the environment, and looks great with landscaping contrasted against it. Below, the fenceline was prety much straight, except for a couple of gentle curves. The grade of the fenceline was also gentle, and did not create any issues. Q: How did the delivery and installation of the Grand Illusions products go? A: The delivery came very quick and I think Brian Holloway at Master Halco’s Raleigh, North Carolina branch deserves a big pat on the back for this. We ordered, signed the deal about mid-week, and by Thursday of the following week we had confirmation the order had shipped. The truck driver actually showed up on Sunday, knowing we weren’t open until Monday. He just hung out, and was OK with that. We were there at 6 a.m. on Monday morning and there he was. We were happy to see him and we unloaded. The builder thought it was going to be a couple of weeks later. We were able to start a little early and because of that the install was complete in time for the grand opening. The delivery worked out real well, and the install was great. It was handy the way they wrapped the individual panels with straps both vertical and horizontal. We actually left those on as we did post/panel/post/panel. We ran for 300 or 400 feet, then we fell back and graded it. We got the tops level and everything plumb and cemented. When we finished that, we went back and snapped those straps, pulled them off, glued the caps on, and we were 100% done. 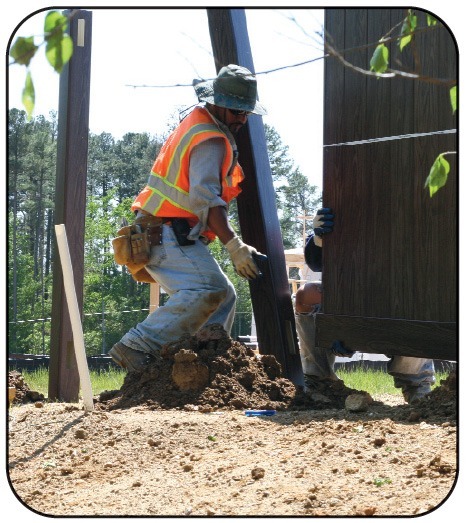 Q: Do you traditionally use the “stick building” style of installing fence? Did you find using the assembled Illusions panels helped your ease of install? A: We do use a lot of unassembled panels, so we were real pleased that these were already assembled. It saved us on installation time. The way they were crated – 12 per bundle – we actually offloaded them with the long forks, set ‘em on the ground and laid two of these full bundles on our truck. So we were able to go out there with the guys, unwrap ‘em, have a post ready, two guys set the next panel, two guys digging ahead of them, and it actually just went real easy versus assembling each panel piece by piece. So that was a big deal as far as making headway. Q: In your opinion, how much time do you feel you saved doing the assembled panels versus stick building? Q: Now did you have any other onsite issues? A: This install was a fence builder’s dream, which is rare. We had Point A to Point B. There was a slight grade, but nothing in the way. It was just a straight line. We had a good grade to work with. We did kind of roll some corners, kind of bring everybody in to the main entrance turn; a couple panels to bring in 24 feet or so. We didn’t get into a situation where we needed to rack. But when we took one of the panels apart prior to assembly, we could see where there was some room where it could rack or grade. It’s been great since day 1, and that’s important with this being Phase 1. There are Phase 2 and Phase 3 to come, so there’s an opportunity to do another 2,000 feet. We’re excited; we’ve got the caps on and everything’s plumb and level. It’s a really picturesque scene. It’s got about a 10’ band of mulch in front of it with bushes and landscaping in front. They are rolling the sod, which is about an 8’ barrier away from it down by the sidewalk. The first thing you see when you pull in is the neighborhood sign, and you see my fence. I’m putting a lot of focus on this neighborhood, not only for the main entryways, but there are also individual houses that are going to need fences. They back up to this nice Walnut 6’ PVC. Now what are they going to do? Put up shiny plastic white fences? No. They’ll say “Hey, let me continue this and make it four-sided.” That’s my future goal right there. So it’s working out real good. I look to continue using the Illusions product in the future. And I do want to say that Master Halco has been really in our boat, working to make this thing happen. I know Illusions had a big part in it as well, to ship it to us in time to keep us ahead of schedule. It put us in the driver’s seat, as opposed to being the ones being pushed about finishing in time to make the grand opening. We actually just worked a five day week, Monday through Friday. That makes the installers a lot gentler and patient with the product, instead of just slamming something together. Brian at Master Halco is the one who made this whole thing happen – from the pricing to the actual delivery to coming over and making sure everything was there. He even asked if he could help put anything up. I said “I think we’ve got that covered.” But that just shows what he is willing to do to help out a customer. I think he’s proud. So you can imagine when I called him to tell him I had a 2,000 foot job. When I first saw the Grand Illusions ads I thought “This is an eyecatcher.” But this area is used to the white PVC. That’s why this developer jumped aboard. He said “I’m tired of shiny white PVC.” So that’s where we had a nice in with him. Because it was a different product and a different look. Q: How did you hear about the Grand Illusions product? A: I’ve been working with Allied Fence for three years, everything from temporary construction fence to aluminum fence, the whole gambit. Of course, when this thing came up, that’s who I called. They then directed me over to the Illusions web site and the Illusions Fence Design Center. I picked it up from there, printed it off, did my bit of salesmanship, if you will, and made everybody buy in on it. Q: What made you choose the Grand Illusions Vinyl WoodBond Walnut versus some of the other Grand Illusions Vinyl WoodBond grains? A: Well, that was the “higher ups,” if you will. Regardless as to which one I was pushing for, we didn’t want something that’s plain Jane, as this is probably the most predominant item of the overall main entrance. I mean, it’s the largest single item other than the groupings of trees. So of course, it’s got to be the signature. Q: So when you saw the installed product, what were your thoughts? A: Well, my initial thought was that it’s too dark. But then as soon as we started putting the green pine trees and other trees in front of it, all of a sudden it clicked and started working like a charm. Like anything else, you have to put a little trim on it to set it off. Q: How did it work out for you guys in terms of the delivery schedule, installation, product quality, etc.? A: I think it was 110% on everybody’s effort. Of course, the initial cost caused some grumbling, which is normal no matter what you do. So after a little negotiation and a little hard work on the part of Kelly Crain with Allied Fence, everything clicked and we were there. Q: As far as the timeliness of the installation, did it all go according to plan? A: I think it worked out exceptionally well. Fortunately, the delivery was a week earlier than anticipated and we started work a week earlier. Theoretically, if they’d started on the original schedule, we’d have been out here with two shifts just due to the volume of it. But actually it clicked together and we got the last of the panels in four or five days before the landscaping started and our theoretical grand opening event. So everything worked out just beautifully. Q: Do you see yourself recommending Grand Illusions WoodBond products in the future? A: Yes. I think it’s a lot better than the stuff you buy down at home centers. There’s no real comparison, to be honest with you. It’s definitely a better material. It seems to be a lot sturdier and heavier – stouter. This is very secure. 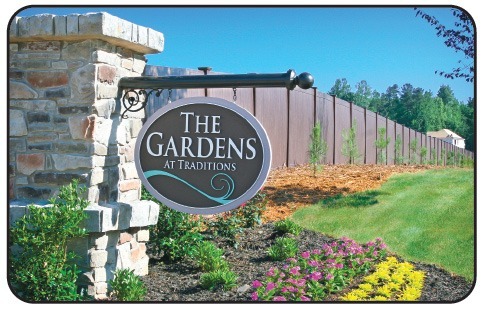 Q: Can you tell us about your sale of the Grand Illusions product to Allied Fence for the Traditions at Heritage Wake Forest install? A: They contacted me and said they had a developer for a subdivision and the gentlemen were looking for a privacy fence with lattice top in a specialty color. I don’t remember what the color was, but it was not a white. He was looking at something like a tan color. So I priced it that way. Then we went and looked at the subdivision and took them a sample of the Grand Illusions Vinyl WoodBond. I wasn’t sure we were going to get the sale until they saw that sample. Once they saw that, it became emotional versus a business decision. Once we got that sample in his hand, it was a done deal. From there, it was just working out pricing and everything else. We worked with Allied Fence and thanks to Illusions having a quick quote turnaround, we worked it out. The gentleman was tickled to death. The developers actually have three more phases coming, which could be another 8,000 lineal feet, and they are committed to use the same product. I think the biggest thing was getting him emotionally involved in our product versus just looking at a tan fence. Q: Do you think that one of the tricks with the Grand Illusions is getting it in front of people so they can get that emotional attachment to it? A: Absolutely! You could see it as soon as we put that sample in his hand. You could see the difference in his mindset and his eyes light up. There’s no doubt that when they see that product and put their hands on it, they’re sold. I mean, it’s very difficult to sell vision like that, particularly considering that it does have a premium price on it. It has to become emotional to them. So that’s just the way it worked on this project, and from that, we’ve already got another homeowners association that’s looking at it on another job that we quoted last week. This market has seen a big turn in the last few months. Some larger corporations have come in so there is some growth in this market versus other markets. The Grand Illusions panels were fitted with vertical and horizontal straps at the factory, and this made handling them a log easier, according to the installers. The installation crew had an efficient system going, where they would install post-panel-post-panel for several hundred feet, then go back and level the tops, plumb everything up and cement the footings. Looking at just a sample, the developer originally feared the Walnut color would be too dark. But as shown above, when installed, that was not the case, and the finished project revealed a subtle hue. Q: Who commissioned the job? A: The developer’s commitment to the homeowners association was to put fencing up at the front so the homes are not right there on the main road coming in. Their commitment was that they would put up a fence as a barrier. So it was a commitment to the HOA, but it was through the developer. 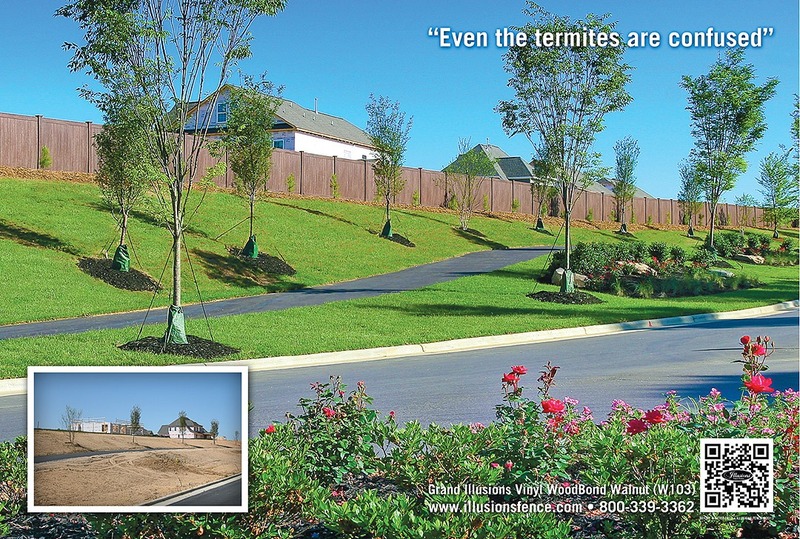 The next part of this is to get the homeowners to put this particular product in their individual yards. That’s one of the key things. There are going to be 800 homes. Q: So the purpose of the fence was a barrier and was it a sonic barrier or just a visual barrier? Q: What were some of the challenges you had in terms of purchasing, installing, and competition? A: The only challenge we had was a time constraint. From the day we started to discuss this project, we had 30 days to finish. So between the time we chose the product, got it quoted, got commitments, got it shipped, and got it put in the ground, we only had 30 days. And what Illusions did was great; we had the product within three days. So that was one of the challenges that Illusions accepted and overcame. The timeliness of Illusions’s delivery on the project worked out great because we needed every bit of that time. Allied Fence was definitely pleased. They had only great things to say about the packaging of the product. It only took them an hour to unload the entire truck. They staged it, put it on trailers and took it out to the job site. It worked out perfectly. Q: What do you have to say about Allied Fence as a company? A: They showed a willingness to partner with Master Halco and with Illusions to go out and secure this project based on the product that Illusions provided. They showed a willingness to work with and commit to us when other people were trying to go in and grab the job. Their commitment was unparalleled in my mind. They could have provided other products. They were committed to both Illusions and us to work together as a team to secure the project. The installation is beautiful, obviously. There are definitely a lot of layers and opportunities in this product. Q: Why do you think the Grand Illusions Vinyl WoodBond was chosen on the project versus other products? A: Grand Illusions Vinyl WoodBond is a very unique product. Photos are great to get the customer interested, but you have to show that display to them. It was an automatic change. I do not deem there being a competitive product against this. The only thing you can sell against this is its price. And if price is that big of an issue, then they need to look at something else. It’s kind of like paint. With a little sample chip it is difficult to get an overall idea until you see it up on the wall. Something about the finished sections is greater than the sum of their parts. If you just take a Grand Illusions board and look at it, you’ll say “That’s great,” but when you put that board down a run of fence, it is pretty amazing. It’s like looking at a sample of hardwood for your home. You can take one strip of hardwood and that’s one thing. But if you envision it over 800 square feet of flooring, it’s certainly more appealing and warmer. The Grand Illusions blends so well with the stone entrance. It was the perfect product and the perfect project. Q: What do you remember was the deciding factor that made the developer choose the Grand Illusions Vinyl WoodBond Walnut grain versus other Grand Illusions colors or woodgrains? A: The stone that they have at the entrance is kind of a taupe and tan mix. I just think the Walnut complemented it so well. So I would say that aesthetically when you see that stone coming in the entrance and that fence comes up beside it, it’s the perfect complement. We were kind of torn between the Grand Illusions Vinyl WoodBond Eastern White Cedar and the Walnut. But there was too much contrast between the Eastern White Cedar and the stone. In this instance, the Walnut just complemented it so well it was a seamless transition, so to speak. That was the deciding factor on the color. I had been hearing rumors from Brian at Master Halco about a “massive project” for some time. I also knew there were competitors out there whom the client was considering, but that so far he really liked what he saw with the Grand Illusions Vinyl WoodBond Eastern White Cedar. I was excited about the potential of this simply based on the location of where this was going to be installed. A job of this size going into North Carolina is great exposure for the Grand Illusions product. I also knew that Brian is gung ho about the product. So I had gotten a really good feeling that this was a job that we were going to land. A few weeks passed and Brian would keep me in the loop with status updates. Section counts were constantly changing and the job was only getting bigger. When that order finally came in, I was extremely excited for both Grand Illusions and Brian. He had put in a great effort and I knew that on our end we did everything possible to help him land that job. Ultimately, the development decided to go with Grand Illusions Vinyl WoodBond Walnut, which is one of our premier vinyl woodgrains anyway. 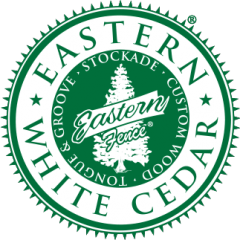 Personally, I’m a bit biased towards the Eastern White Cedar WoodBond, as it’s my favorite, but there was no going wrong in whatever choice was made. All of the Grand Illusions Vinyl WoodBond choices are rich, life-like, and beautiful. The Vinyl WoodBond line will complement and accent any home or property. After the order was delivered, we received a few photos of the job as it was going up and it looked just as I had thought it would. The customers at the housing development were so happy with the product that they ordered samples of the Eastern White Cedar, Walnut and Rosewood to show at the model home they have set up. 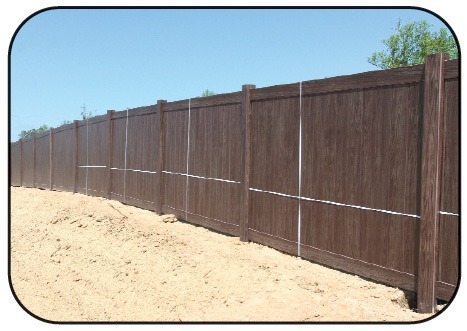 If a new homeowner decides to go with a vinyl fence, those would be the three choices presented to them. So not only will they have the Walnut at the exterior of this development, but there is the chance to show off two other Grand Illusions Vinyl WoodBond choices in full force from home to home. Altogether, this was a major home run for us and I was very happy and proud to be a part of this project. I expect many more to come from this area as time goes on. director of sales, Eastern Wholesale Fence Co., Inc.
Q: What were your feelings about the opportunity this job presented? A: As soon as we heard about this project, we knew that the Vinyl Woodbond line of Grand Illusions would be a perfect complement to the landscape of this new development in North Carolina. When Walnut was chosen, we knew it would really be something special. All of the Vinyl Woodbond finishes offer an accurate representation of that species of wood, but the Walnut grain has such warmth that it is the perfect choice to greet potential new home buyers. Q: What else can you tell us about the rest of the Grand Illusions product line? A: That’s what is great about the Grand Illusions family of products. There is just so much to talk about. The lifelike woodgrains look like the real thing from five or 50 feet away. The ability to custom color match and the 35 available colors allow it to fit into any design scheme or designer’s hardscape. For the fence professional or landscape designer, not only does it differentiate them from the competition, but it helps create that “signature job” that they can be proud to show off. 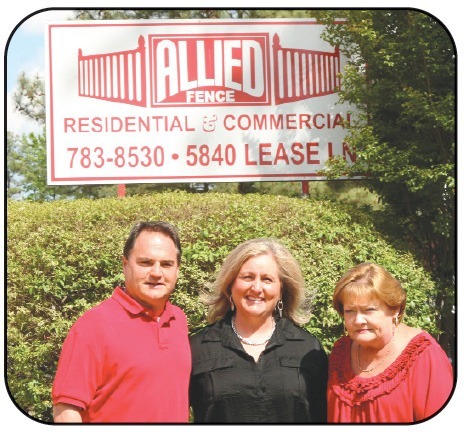 Allied Fence is a family run operation! Left to right are company president Tony Crain, his wife, Kelly Crain, and sister, Ivy Parrish. 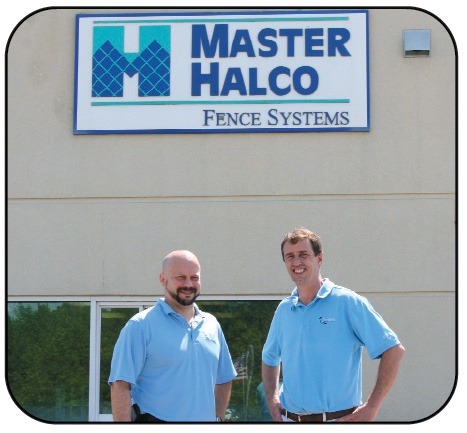 Pictured above are Master Halco Raleigh, N.C. brance manager Bill Carpenter, left, and territory manager Brian Holloway. For more information on the complete Illusions line of color vinyl fence and Woodgrain vinyl fence, e-mail info@illusionsfence.com or visit www.illusionsfence.com. Centerfold of World Fence News July 2013 Issue.